For those looking for a way to transform an event into an unforgettable experience, there is nothing better than Anita Dee Yacht Charters. 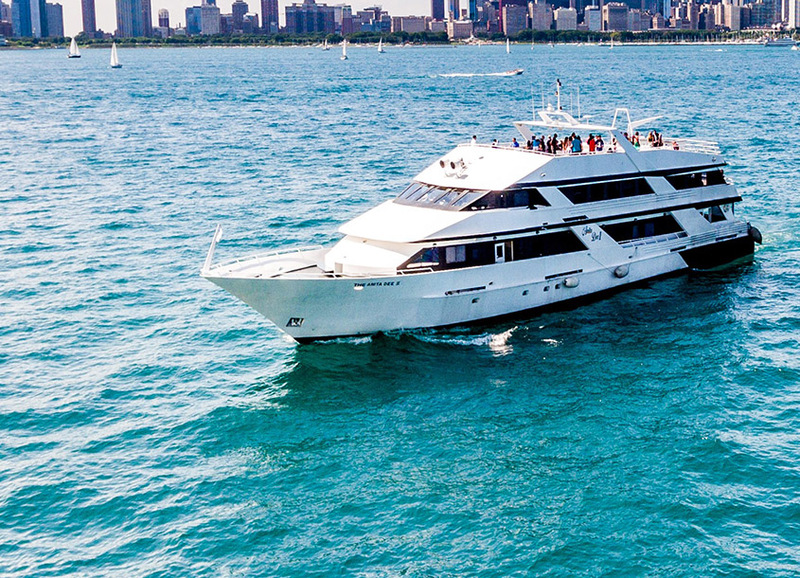 With a relaxing, luxurious trip around Lake Michigan and the Chicago River, any wedding, business meeting, reunion, or other get together is automatically transformed into an incredible occasion. With multiple docking locations available, Anita Dee can provide not just time on the water, but transportation to the ideal setting to further your interests. One such popular location is the Horseshoe Casino in Hammond, Indiana. With entertaining performances, great food and drinks, and all the tables and slots you could ever want, sailing down to Horseshoe Casino on the Anita Dee or Anita Dee II make for an enjoyable outing for all patrons. Our expert crew is ready to chauffeur you and your party in the highest possible style across the idyllic waters around Chicago and Northwest Indiana, whether your needs are business, pleasure, or romance. With more than 35 years in business, Anita Dee Yacht Charters has become the preeminent yachting option in Chicago. We pride ourselves on creating the ideal atmosphere for our clients while taking them anywhere the water leads. To find out more about how to reserve your own memorable yachting experience, call us at (312) 379-3191 or fill out our email form. We are docked at DuSable Harbor on Lake Shore Drive on the south side of Navy Pier. The Horseshoe Casino offers a number of enjoyable activities designed to entertain all parties. There are, of course, the games, which include slots, video poker, a poker room, and all the traditional table games (such as craps, blackjack, and roulette). If gambling doesn’t interest you and your party, however, the Horseshoe attracts famous musicians and entertainers from all over the country. Whether it’s concerts, comedy, or game shows, the Horseshoe Casino offers some of the best around. Finally, the casino comes with an upscale steak restaurant called Jack Binion’s, which the Chicago Tribune has said compares to some of the best fine dining in downtown Chicago. Once your party has finished with the casino, many other nearby attractions are within easy driving distance. These include sports, music, and outdoor activities. Golf with a view of the iconic Chicago skyline at Lost Marsh Golf Course, which offers an 18-hole public course and a 9-hole executive course, as well as a driving range and restaurant. This award-winning course offers world-class golf just outside the big city. The Indiana Dunes National Lakeshore offers an elusive pleasure of the Midwest: sandy beaches. The dunes that give the park its name are sandy hills that run into Lake Michigan. Whether you are looking for summer swimming, beautiful views, or just a chance to relax and put your feet in the sand, the dunes are a great way to unwind at the end of a big event. At more than 125 years old, the Porter County Memorial Opera House is a piece of history as well as culture. The hall has been visited by icons such as Theodore Roosevelt, John Philip Sousa, and the Marx Brothers, and it continues to be an excellent venue to take in music and plays. Recent performances are more local-focused with far less opera, but still a good time. For slightly more upscale performance, consider the nearby Northwest Indiana Symphony, where the classics are firmly on display. With holiday-themed events as well as performances of great composers’ works, an evening of culture is sure to be popular with your whole party. If you are looking for musical history that is a little more recent, consider a trip to Michael Jackson’s hometown of Gary, where you can find the house he and his siblings grew up in. The home is open to the public and can provide for interesting conversation and an excuse to listen to some great pop music. If you are looking for fine dining aside from Jack Binion’s in the casino, the area around Horseshoe Casino offers plenty of options. Set on the waterfront in a Victorian cottage built in 1895, 54 Main Bistro offers more than just great food, with local craft beer and wine to drink and local art on display. Adding to the quality experience is Bistro 54’s commitment to using only fresh ingredients in all their dishes. They have a no freezer policy. For the slightly more exotic palette, consider Asparagus, which offers a menu inspired by Thai and Vietnamese dishes with French influences. Asparagus promises a “zen-like environment” with the design borrowing from classical, modern, and Asian influences. The menu comes complete with a full bar. There are also regular musical performances by world-class musicians. Set on the shore of the intimate Cedar Lake, the Lighthouse Restaurant offers more than just a pleasant view. With a focus on seafood and steak, the restaurant delivers a delicious meal to go with the scenery. The restaurant is large enough to accommodate large parties but is designed to provide a sense of intimacy at the same time. No matter where you want to sail, Anita Dee Yacht Charters is ready to accommodate your vision for the perfect trip. Whether your aims are for the ideal product launch or the perfect engagement party, we can provide you an unforgettable venue. To learn more about what the Anita Dee and the Anita Dee II have to offer, look through our photo gallery. We also suggest you peruse our price list for both yachts to find a package you feel works best for you. When you are ready to reserve your next yachting adventure, call us at (312) 379-3191, or fill out our email form. Or, come see us where we are docked in DuSable Harbor, just across the Chicago River from Navy Pier.